Originally appeared in The Times-Standard, Eureka, California. Painting by Bill. With watercolors, he once painted in the spirit of self-expression. A blob of color here, a line there. There was acclaim from other primates, so closely related on the evolutionary tree. But now his brushes remain at rest and the canvas is bare. His hair is graying. And thinning. On a typical day there’s an older woman, a familiar face, and several kids he doesn't know, laughing and pointing. There are also adults acting like children, trying to make chimplike sounds. He performs. Swinging from a rope, climbing the 15-foot enclosure and dancing on the table. Then it's time for yogurt from the zookeeper. He clings to the bars. The flavor masks the medicine so desperately needed to keep the chimpanzee alive. At 53, Bill has done more for his species than he knows. Referred to as an ambassador; the popular chimp at the zoo in Eureka, Calif., has raised awareness for humankind’s closest evolutionary relative. He's the oldest living male chimp in the world; he's pushing the limits of zoo geriatric care. “Most people assume this has been our third or fourth Bill,” says zoo Superintendent Jack Bellinger. It is unknown if Bill grew up in the wild or was born in captivity. He came to Eureka at age 11 as part of the traveling Pollack Bros. Circus after performing for such dignitaries as the Queen of England. During his visit, his personality carved out such a place in school kids' hearts that they took up a collection to make him a permanent resident. The cost: $350. When Dr. Jane Goodall first landed on the sandy beaches of Gombe in the early 1960s, the world was about to be exposed to its distant past. Chimps previously owed their popularity to talk show appearances and sideshows. They rode bikes, put on clothes and performed other demeaning acts. Scientists who realized their intelligence and ability to follow orders made them America’s first astronauts. Through Bill's eyes, the five-acre Sequoia Park Zoo, like many other institutions, has gone through an enormous transformation. No longer can zoos, despite their size, think locally. They have united in an international effort for the survival of species and animals like Bill. The science is complex. Zoo employees now find themselves crunching data on keyboards and filing paperwork. And much of the work is on a volunteer basis. When Bill was born shortly after World War II, it was estimated that there were millions of chimps in central Africa. Their numbers have dwindled to 100,000 to 230,000 today, reserving them a spot on the Endangered Species List. Zoos no longer aim for bragging rights, competing to see who has the most exotic animals. Bellinger says back in the 1970s, zoos were beginning to explore new concepts. The Sequoia Park Zoo began operating in 1907 as a small collection of animals at the 77-acre Sequoia Park. The land was acquired by the city in the 1890s from the Bartlin Glatt family. It's the only known zoo amid a redwood forest and has grown to support about 100 animals including black bears, lemurs and nyalas (African antelope). The zoo was honored when it became accredited by the American Zoo and Aquarium Association for its dedication to animal care and public support. Of the 180 or so "AZA" members, the Sequoia Park Zoo is among the smallest. The application is several inches thick and the process took years. Bellinger says the zoo has to be re-accredited every five years. "It gives us a voice and a great deal of respect," Bellinger says. "It takes a lot of people and a lot of time." Under AZA's direction, the Species Survival Plan program began in 1981 to maintain a healthy and self-sustaining population that is genetically diverse and demographically stable. Selection is both practical and political. So-called flagship species like giant pandas, Siberian tigers and lowland gorillas arouse strong public feelings, while lesser known creatures are protected for their importance to ecosystems. Master plans for each species outline the goals for the population and design a family tree. Sometimes the best course is to stagger breeding or have no breeding at all so the animals won't outgrow holding spaces. Studbooks contain vital records of an entire captive population of species: births, deaths, transfers and lineage. Computer analysis allows for sound breeding recommendations. Bellinger is the regional studbook keeper for the king vulture even though the zoo doesn't host the species. Occasionally, keepers swap notes at studbook conventions. Husbandry manuals set guidelines based on the best scientific knowledge for diet and care. Since most zoo animals are born in captivity, it makes it easier when they are traded from one institution to another. Recently, two Eureka-born spider monkeys were sent to the John Ball Zoo in Grand Rapids, Mich., to join a new breeding colony. The Sequoia Park Zoo joined a project to evaluate the population genetic structures of golden lion tamarins, an endangered species that survives only in a small area of Brazil northeast of Rio de Janeiro. Genetic data derived from hair samples taken from the little monkeys that sport lion-like manes will help determine future management plans for the species. The project is critical. The tamarins number barely a thousand and about half are in captivity. Monkeys are much smaller than apes and are more widely distributed throughout the world. They have prehensile tails and are considered, by human standards, less intelligent than apes. What would become apparent later is that chimps are actually 98.4 percent genetically human. Anthropologists estimate that humans separated from the Pan paniscus line four million years ago. That line later split into chimps and bonobos. Besides DNA, there are striking physical similarities as far as hands, feet, and the nervous and immune systems are concerned. Behaviorally, there are yet more connections. Goodall and other primatologists have dedicated their lives to studying Bill's relatives and their research has illustrated the intricacies of the large ape's brain. Chimps communicate in a variety of ways from grunting to gesturing. In Visions of Caliban, Goodall wrote: "There is one very common communicative signal used by chimpanzees everywhere — a soft, coughlike sound usually accompanied by a sudden raising of the arm. This arm wave looks like a similar gesture made by humans and, for humans and chimpanzees alike, it seems to convey much the same message: 'Leave me in peace.'" A famous chimp named Washoe learned sign language and could associate the signs with eating and drinking. But evidence is lacking to show that chimps can combine symbols to create new meanings or use syntax. 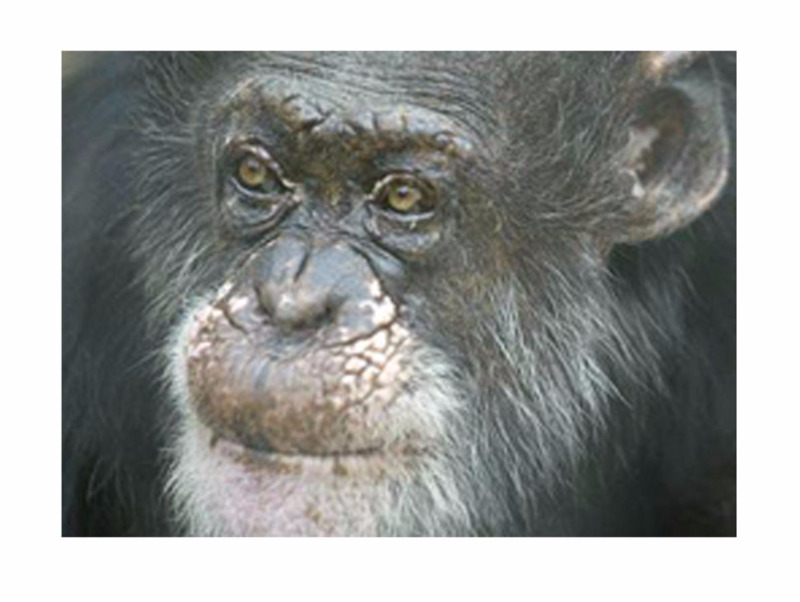 Goodall’s research, however, has shown that chimps can deliberately plan. When the late Figan, an alpha male chimpanzee, was young he led the other chimps away from their camp then returned alone to help himself to the bananas. Chimps are also well-known for using tools, such as using sticks to fish termites from their mounds or turning leaves into sponges. Creationists have long disputed evolution. Realizing the different views, Bellinger says the zoo tries to allow people to appreciate various animal habitat rather than turning it into a religious or scientific debate. Bill’s quarters were designed to stimulate. He has a fake termite hill with buried treats, a color TV in his backroom tuned to PBS, and then, of course, there's his art. As part of an enrichment philosophy, Bellinger wondered what Bill would do with watercolors. 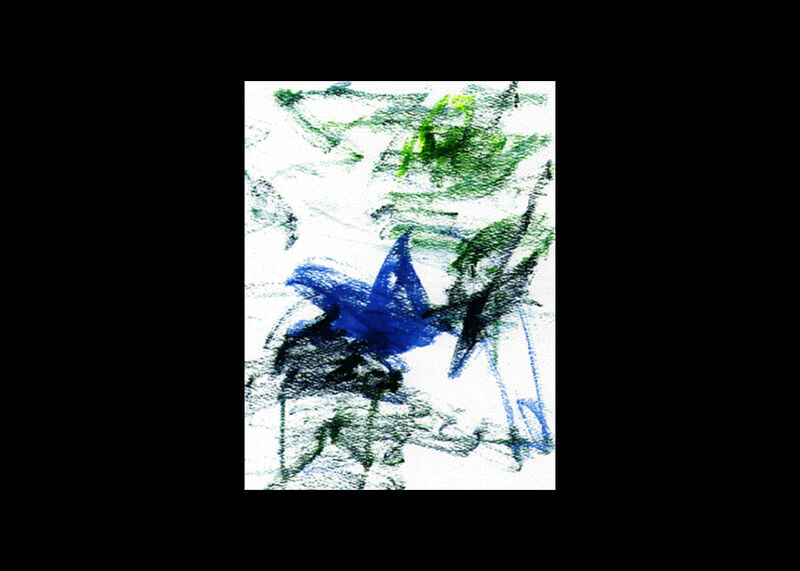 At first, they thought he might paint his walls, but the chimp quickly learned to operate within the boundaries of the paper after he was shown what the brush would do. "He didn't have any formal schooling in art," Bellinger jokes. With his semi-opposable thumbs, the 85-pound Bill, small for his age, was always left alone to create and was never video taped. He selected the colors and went about his work until, at some point, he simply stopped. For several years, he had an artistic neighbor, a chimp named Ziggy who died in 1996. His passing received national attention. Ziggy spent his childhood performing in nightclubs until his owner lost control of him as he matured. In 1963, the city rescued Ziggy from an animal shelter. The two chimps' styles differed quite dramatically. Ziggy was heavy with the colors while Bill's pieces were much more subtle. The paintings were sold at a fundraising art show in Eureka City Hall in 1995. Life is good for Bill as he receives some of the best medical care available. A birthday party was held in his honor when he turned 50, a milestone for a species that typically survives half as long in the wild. The chimp even received congressional recognition at the well-attended "dress casual" event. Bill, who now has the full run of the cage after a fence was removed following Ziggy's death, has quit painting. Bellinger said they occasionally offer him watercolors, but he seems to have moved on to other things in life. He can go into his backroom whenever he wants, but he chooses to stay out in the open with people. The world has changed ever since Bill came to Eureka. With the closeness in genetics, Bill's treatment in the circus could now, perhaps, be viewed as discrimination. Out of respect, Bellinger doesn’t want to release much about the chimp’s early years until after Bill's death. While many small zoos are extinct like the animals they were trying to protect, the Sequoia Park Zoo is still holding on to a small corner of the animal kingdom. That's due, in part, to a few good ambassadors. Postscript: Bill died in 2007 at the age of 62 after battling a long illness.